The U.S. Mint has released its latest numismatic sales report, giving us our first look at totals for the 2016 Ronald Reagan $1 Coin Cover. The Reagan Coin Cover saw 12,902 sales during its opening week, more than were seen for either of the previous 2016 releases in this series, which featured Richard Nixon and Gerald Ford. 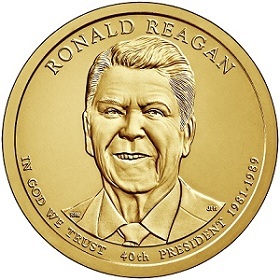 The Reagan Coin Cover was the Mint’s best-selling product by far during this period, which yielded modest sales overall. The 2016 U.S. Mint Proof Set saw a dip in demand, but still managed to be the second-highest-selling item of the week with 3,844 new orders. Third place went to the 2016 U.S. Mint Silver Proof Set with 2,531 sales, while the fourth spot belonged to the 2016 U.S. Mint Uncirculated Set with 1,708. Fifth place was a tie between “P” and “D” 25-coin rolls of 2015 Native American $1 coins, which each sold 807 units. The full weekly sales report is included below. The following statistics show total sales for the listed items through August 21, 2016. The first numerical column includes information from the Mint’s August 14 report, the second column displays this week’s updated numbers, and the third column tallies the increase in sales over the last week. Items new to the report are listed in bold. For more information on any of these products, please visit the U.S. Mint’s online product catalog. Can anyone explain the huge (807) order of 2015 NA $1 rolls? Why wouldn’t they just order 81 boxes ($250) instead? Big price difference of $5 per roll. Happy to see the order though. Looks like the 2015 issue will hit about 2.5M sold total.